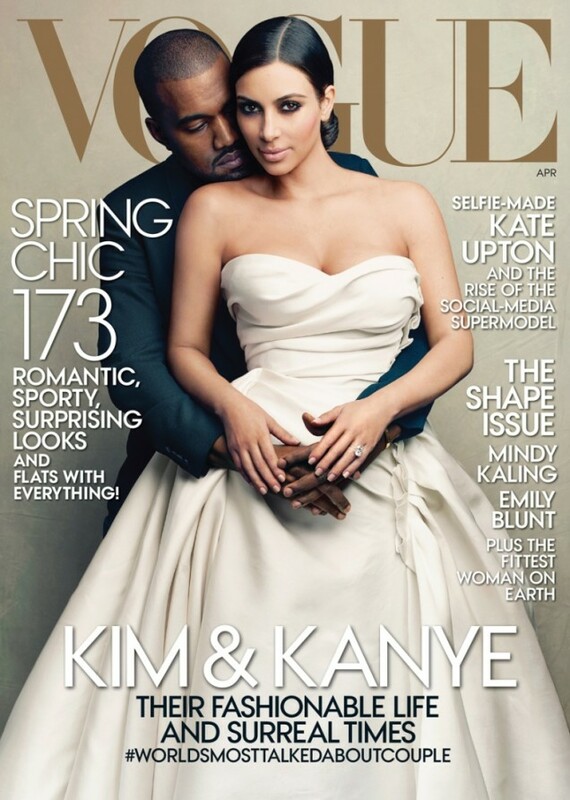 Kanye West and Kim Kardashian cover Vogue. -Hey, remember when Anna Wintour was all “to be in Vogue has to mean something“? What just happened? Did she lose a bet? -Let’s hope Victoria Beckham has a good support system set up around her today, because you just know her and Kim on are opposite ends of the feelings spectrum right now. Treat yourself to an extra edamame bean tonight, Posh! -As expected, the Twitter reaction to the Vogue cover was swift and brutal. –Madonna Instagramed a photo of her armpit hair right after I taped a segment for tonight’s eTalk on this week’s celebrity Instagram scandals, which was super inconsiderate of her. -Seriously, could Scarlett Johansson look any less pregnant? -Stock up on wine: ABC has confirmed that this season of Scandal will end April 17 to accommodate Kerry Washington‘s pregnancy. –Anna Paquin clearly has hubby Stephen Moyer wrapped around her little finger. That photo kind of makes me love them both. -Ruh roh. Are producers manipulating who wins on The Voice? -Meanwhile, there’s a reason this video of a Sicilian nun auditioning for Italy’s version of The Voice went viral today. -Ready for some news that’s truly truly truly outrageous? The Jem and the Holograms cartoon is becoming a live-action movie — thanks to Justin Bieber’s manager. The producers are polling the Internet for casting advice, though I’m on board with most of these suggestions. –Andrew Garfield spent some time teaching autistic kids how to surf because he’s the greatest. –Lindsay Lohan tweeted this in response to Radar’s report that she’d fired her sober coach. -Congrats to Chris Hemsworth and Elsa Pataky, who just welcomed twin boys. -Also congrats to Alyssa Milano, who’s expecting her second child. -Amid rumours of trouble in their relationship, Kate Hudson and Matt Bellamy spent the day at the beach. –Enrique Iglesias showed off his seduction skills on a random Watch What Happens Live audience member. It was predictably gross. –Idina Menzel is smart enough to realize that John Travolta‘s flubbing of her name did wonders for her profile. -The trend of resurrecting TV shows may continue with HBO’s The Comeback, which is one of those shows I always heard great things about but never actually got around to watching. –Zoe Kravitz brought Jaden Smith as her date to the Los Angeles premiere of Divergent on Tuesday night for reasons I don’t understand. His critique of her dress was pretty spot on, though. -On last night’s Kimmel, Zoe talked about what it was like growing up with famous parents, saying she once woke up to Ashton Kutcher making omelets in their kitchen. –Kate Bush just announced her first live shows in 35 years. I’m going to celebrate by listening to “This Woman’s Work” on repeat all weekend, which should make for a super fragile Monday. -Also, the little girls who play Lizzie and Mika recorded a song together inspired by last week’s episode. It’s…not good. -Buzzfeed’s list of the 33 most awkward celebrity encounters of all time is gloriously cringe-worthy. –Blake Lively‘s publicist clearly deserves a raise. E!Online is currently running a nothing story about how the actress is “pulling all-nighters” on the set of her new movie (burying the part about it being night shoots). Someone give her a medal. –January Jones‘ charm metre is set to 11 this week. -Last night’s episode of Community might have been this season’s weakest, but it still delivered a few laughs. They’re certainly not shying away from the weird; here’s a look at their upcoming animated G.I. Joe spoof. -It’s probably weird to be coveting Angelina Jolie and Stella McCartney‘s Maleficent-themed capsule collection when you don’t have kids, but I’m doing it anyway. –Liam Neeson may play a hero in the movies, but he’s denying reports that he saved a stray dog in Central Park. -The new Orphan Black posters for season 2 are great. Two (two!) random strangers struck up conversations on the subway this week when they noticed I was reading the OB issue of EW — and that never happens. -Here’s the second trailer for the late Paul Walker‘s parkour-centric Brick Mansions.